It’s the magazine that has been a long time coming, let’s be honest. We recently came across a publication called Stand Magazine, touting itself as the the “magazine for men who give a damn”. One of the ways they are aiming to stand apart from most other traditional mainstream magazines aimed at men is the absence of objectifying content regarding women. A quick look around the Stand website, and you’ll see images and stories about and by women that position them as equals, and don’t filter the portrayal of women through a male gaze in a way to reduce their agency or autonomy. That’s pretty darn refreshing if you ask us! With all the recent major news stories about sexual misconduct, discussions about toxic masculinity and indeed narrow ideas of what it means to “be a man” are now being dissected in a powerful way. Stand was already in existence before the big Harvey Weinstein story broke, but this year has been a major re-examining of masculinity, especially through the lens of politics, most notably with Donald Trump’s Access Hollywood tape being explained by some men in power as merely “locker room talk”. Thankfully there were a number of men condemning this abhorrent behavior, as well as those complicit in allowing it to be normalized via political narratives. Having released 7 issues so far, Stand is fostering a well over-due conversation among men in pop culture that allows for nuance, empathy and inclusion. The quarterly print magazine was founded by Dwayne Hayes, who has worked in the publishing world for nearly two decades. Before publishing, Dwayne was a therapist and social worker, primarily working with young males and adult men with a history of domestic and sexual abuse, as reported by the Mr Magazine website which spoke to Dwayne about Stand in December 2016. Dwayne told Samir Husni that the idea for Stand had been formulating in his mind for a number of years before finally coming to fruition. Today he envisions it as a magazine that can encourage men to think outside the box of what others mags like Esquire and GQ typically offer. “I didn’t think there was a magazine out there for men such as we envisioned, and that was one that really promoted a different view of what men and masculinity meant. 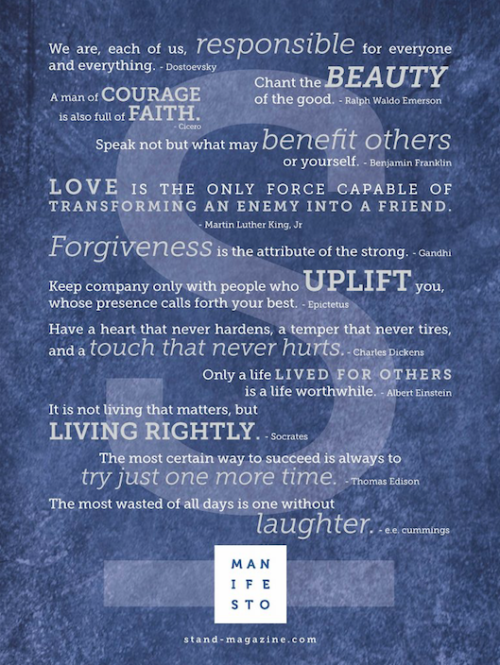 And to encourage and challenge men to reject some of the stereotypes about manhood and to really embrace a view that spurs men to be equal partners in all aspects of life; in raising children; in parenting; in taking a more conscious and ethical look at their work and what they do; reducing violence in the world, violence against women and children,” he said. He also explained how Stand is going against the norm in the way it includes the voices and images of women. “You’re not likely to see women in bikinis in Stand either. (Laughs) In Issue #4 we have the swimsuit portfolio, which was literally suits swimming on a beach. We are attempting to turn some of the things upside down that is usually in men’s magazines. And similar to what you might see in GQ or Esquire and some of the others; we’re going to highlight a woman that we admire and that woman is going to be someone we admire for the quality of her character; who she is and what she does, rather than how she looks in a bikini or lingerie,” he said. Can we just take a moment to say how awesome this is, and how thankful we are for awesome men who believe in reforming culture to be a safe space for everyone, rather than a divisive “battle of the sexes” environment that still exists in a number of ways. When you look through the “About” section of the website, you get a glimpse of what to expect from their content. 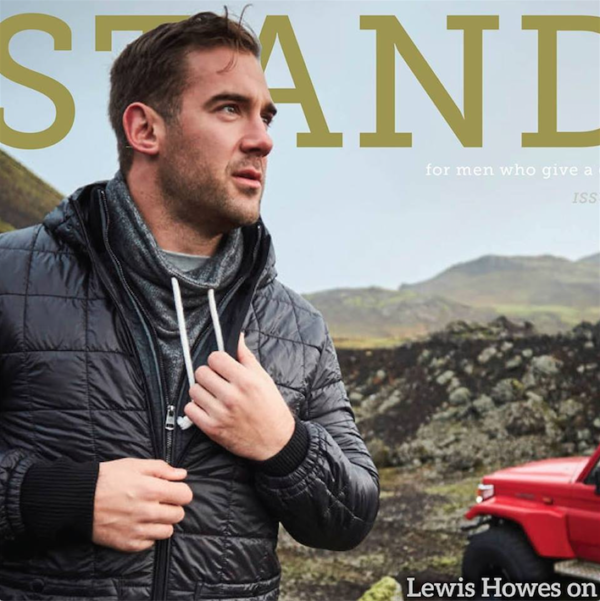 “STAND magazine takes a stand for a balanced and whole-hearted masculinity that embraces the expression of emotion as strength, promotes a healthy body, mind & spirit, appreciates style & good humor, and seeks to shape a world of peace for all,” it says. 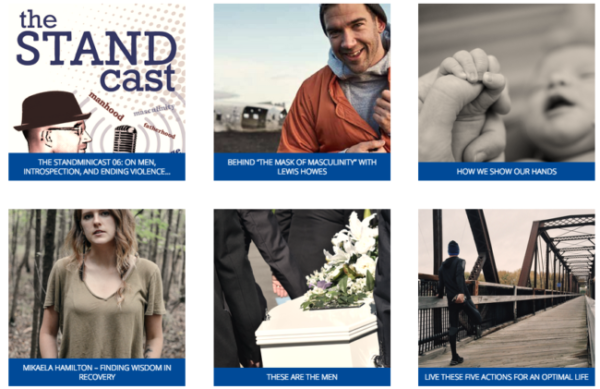 On the home page we saw articles about ending violence, men’s role in speaking out against sexual assault in the #MeToo movement, and taking off the “mask of masculinity”. In the Culture section, one article that particularly caught our eye was the “Faces Of Chaco” ongoing photography series documenting the lives of Indigenous people in Greater Chaco region Northwest New Mexico who are speaking out in defense of their land as it is under threat from big oil and gas developments. The project was undertaken by photographer Rob Zeigler done in partnership with the San Juan Citizens Alliance, a non-profit organization that advocates for clean air, pure water and healthy lands in the San Juan Basin, and community activists from the Greater Chaco region. With Indigenous issues coming into mainstream conversations in recent years, most notably regarding the Dakota Access Pipeline, an article like this is helping to amplify voices and stories that sadly do not get enough coverage in general. These are the kinds of inspirational articles and content readers can expect, along with other popular topics such as fatherhood, fashion, health, career, and relationships. Dwayne says one of the things he wants to be clear about is that they aren’t afraid to be vulnerable and admit failure – a topic that is sometimes seen as something to be avoided in order to foster a false sense of masculine strength and power. “As an editor and a founder, you kind of set yourself up for people to view you as thinking that you’re an example of what a man should be. (Laughs) And for anybody who reads my editorials in each issue, I think one of the things that has resonated with our readers is that my editorials are full of failure; the ways that I have failed as a man. And how I’m struggling and learning to become a better man. The magazine is really about that struggle that we all go through to live as the men that we envision ourselves to be and as the men that we’ve always wanted to be as well. So, the magazine is a way to call us to that vision and to encourage us to that,” he said. When you sign up for the Stand newsletter, you are sent a link to a free gift. It is a sort-of comic strip, titled ‘An Illustrated Guide To 21 Skills For The 21st Century Man’. It outlines how a modern-day man does things like grow a vegetable garden, play with his children, isn’t afraid to apologize, writes poetry, “politely and logically winning an argument” , as well as more traditional masculine ideals such as participating in sporting activities and cultivating outdoor survival skills. If Stand represents even an ounce of what modern masculinity looks like and is defined by, the future is in good hands, and gender equality is not just some pipe dream but an obtainable goal. Check out the Stand Magazine website, and subscribe to get your quarterly copy in the mail.